Fulmer Falls is the second waterfall located in the George W. Childs Recreation Site in Dingmans Ferry, Pike County, Pennsylvania, United States of America. The falls are downstream from Factory Falls and upstream from Deer Leap Falls on the Dingmans Creek. At 17 meters (56 feet), it is the largest of the three falls. There’re picnic tables set throughout the recreation area ad restroom facilities are also available here. 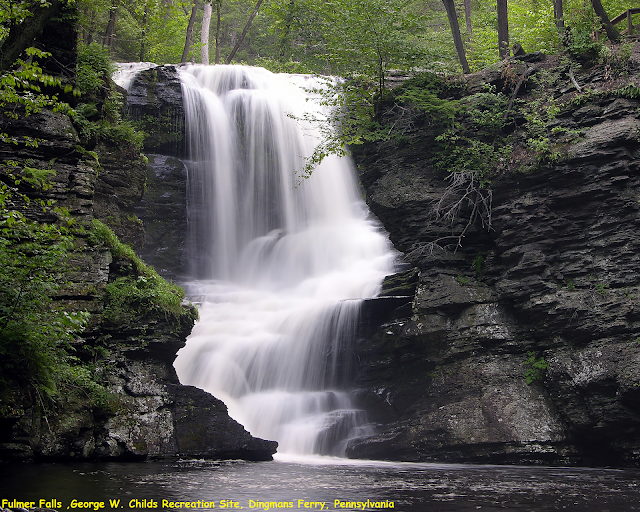 The nearest major town is Dingmans Ferry, PA. Fulmer Falls is a magnificent waterfall to photograph. You can picture the entire falls. 3) From the parking lot, start walking left toward the very clearly marked boardwalk/trail. Fulmer Falls is nearest the parking area.